Bernard Cornwell’s 1981 novel, Sharpe’s Eagle, follows the exploits of Lieutenant Richard Sharpe in a campaign on the Iberian peninsula during the Napoleonic wars. 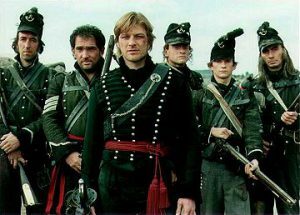 The Sharpe novels were then adapted for UK channel ITV in the early 1990s, with British actor Sean Bean taking the lead role of Richard Sharpe. He’s the one in the middle. Why am I telling you this? Not because I want to rework old parallels between military and organisational design or leadership – I think our views of organisation have been influenced enough over the years by the over-emphasis on these metaphors. I am telling you this, in part, because I believe that if we always look to the same sources for insights this is unlikely to be the route to anything new. And also because I think Sean Bean’s Richard Sharpe has something important to say to us about being a change agent. But if you don’t run; if you stand…and fire volley after volley, three rounds a minute, then they slow down…all you’ve got to do, is stand, and fire three rounds a minute. Now you and I know you can fire three rounds a minute. In organisational transformation we often spend a lot of time and effort strategizing and planning. Teams of highly skilled executives display a huge amount of competence in researching options, fleshing out proposals, making recommendations. As leaders and change agents, we take change seriously, and carefully consider the implications of what we are about to undertake. This is our technical competence, our ability to fire three rounds a minute using a standard issue musket. However, what Sharpe is saying is also required of the situation, is something different, namely the ability to “stand”. In an organisational change context, this is perhaps being able to “hold the space” when working with change and transformation; to know that there will be times of high anxiety and uncertainty, and having the self-awareness to stay in the moment. Ed Schein, in his seminal works on organisational consulting, talks about there being different modes of intervention. The “expert mode” sees consultants or leaders drawing on their own expertise, their technical competence, their musketry skill so to speak. This can be extremely helpful. However, in a situation where transformation, or change, is required, advising from the existing paradigm may not bring about the difference needed. Schein’s focus is on a mode of consulting he calls “process consultation”. The aim here is to stay in the present moment within organisational life, to observe organisational and interpersonal dynamics in teams and departments as they unfold. This includes moments of tension, anxiety, and conflict; and requires the ability to “stand”. Taking this further, Bill Critchley talks about the role of a change agent being to “seek to raise the levels of anxiety sufficiently to disturb the equilibrium and create readiness for change” (Critchley, 2001 (italics mine)). From a complexity perspective, it is the very act of bringing in (potentially anxiety provoking) newness that may cause the disturbance which allows a new pattern of interaction to establish itself (or, a change to take place). This can feel uncomfortable, and the temptation for us as leaders can be to try and smooth any disruptions. However, if we work on our ability to “stand” through this period of temporary turbulence, and not smooth away the difference, then there is a chance something new may emerge. And whilst we are standing, what are we standing for? Gestalt OD thinker Edwin Nevis talks about the importance of “presence” when intervening in organisations with the intent to transform. The change agent must “stand for something”. This need not be as literal as standing for a particular organisational agenda, but there must be something discernible and authentic about the person’s way of being in the organisation; there must be something different, that raises interest. Otherwise the agent or leader fades into the organisational background and cannot disturb enough to have a transforming effect. So, it seems there is more to Lieutenant Richard Sharpe’s question than meets the eye. Our skills and competencies remain of vital importance to our work. However, if we don’t also acknowledge what it means to experience anxiety and uncertainty in organisations, and catch ourselves in our habitual attempts to smooth disturbance in order to escape from it, then we may remain stuck in the paradigms we are trying to change. Beyond skilled technical expertise there is work to be done, as change agents, on our self-awareness and on what we stand for; so that, when the question is asked of us, we can remain standing. Critchley, B. (2001). The role of the management consultant in the change management process. In P. Sadler (Ed. ), Management consultancy: A handbook for best practice (pp. 274-290). London: Kogan Page.